Students will be able to discover and explore probability using a coin toss. Uncertain of probability? Start with a coin toss! Probability: A number from 0 to 1 that tells the chance that an event will happen. The closer a probability is to 1, the more likely the event is to happen. You may think what I thought going into this lesson. The probability of landing the coin landing on heads is 50%. So if the coin is tossed 100 times, it will land heads about 50 times and tails about fifty times. That is not exactly correct. Each time the coin is tossed there is a 1 out of 2 or 50% chance of the coin landing on heads or tails. This means the chance is reset to 1 out of 2 each time the coin is tossed. If I toss a coin only 10 times I may end up with 9 heads and 1 tails. This is not a 50 - 50 chance. My data collection will become closer to 50 - 50 tails the more I toss the coin. 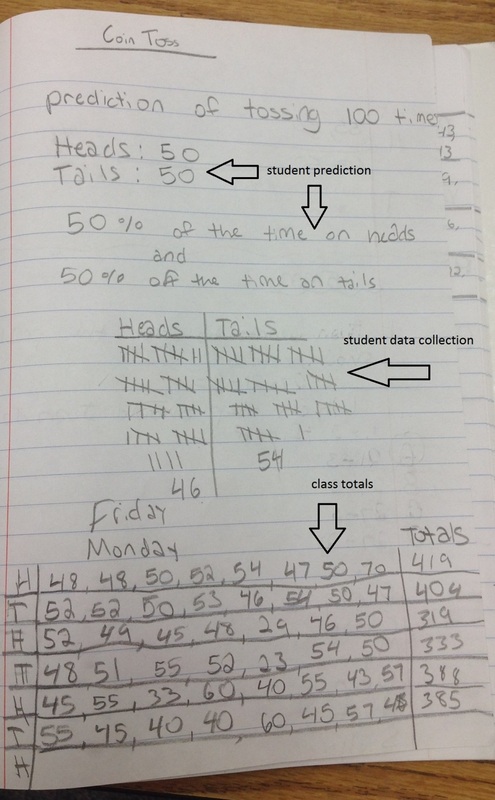 I start by having my students create a "Heads Tails" T chart in their math journals and then writing a prediction for the result of tossing the coin 100 times. You may hear some groans about the number. I take it as an opportunity to discuss sample size as well as perseverance in completing a task (MP1). One thing I have noticed talking with colleagues is that students need to put more effort and perseverance into completing activities. They have spent many years with the text book, or teacher, giving the answer or walking them through the steps, and have not developed the stamina or patience to follow through. After all the students have finished gathering their own data, I have them copy the chart on the bottom of the student work into their books. Because I don’t have a lot of whiteboard space and I am continually writing and erasing, I draw the chart on the board while the students are tossing their coins. If you have room you could have this already drawn. Then we collect the number of times each students coin toss resulted in heads and the total number of times it landed on tails – having the students also write it in their math journals. At this point I realize each student may have a different total at the end of the row because they didn't have as much space as I did. Next time I will make sure they copy it exactly the same or make sure I tell them we will all have different numbers as totals. The final total should match up, but if they don't this is another opportunity to talk about reasonableness of an answer. A discussion can then be started about how the total number of heads and tails are closer to 50/50 the more times the coin is tossed. This is shown in the student work under the column totals. We also added together the total number of times the coin was tossed to get. I have students continue on to add the total number of tails to the heads to get 2,248 and then compare it to the 23 students we had in class. We should have had a total of 2,300 tosses but we are 52 short. If you don’t have students bring this up you could lead the discussion in this direction. I have them look back and analyze the data to see if they could figure out why we are short. After a few minutes students begin to point out one person reported 29 heads and 23 tails. They only tossed the coin 52 times. They also point out the data where a student reported 52 heads and 53 tails – they tossed the coin 105 times. They continue on pointing out where the number of heads and tails do not add to 100. This lead to a great discussion about the reasonableness of statistical data (MP2) and an opportunity for students to use/practice the vocabulary words of probability and possible outcomes. To further analyze the data we collect, students create a line plot (a portion of 5.MD.B.2) to represent the number of times the coin lands on heads or tails. Students discover on both plots 50 was one of the highest representations. At this point a student points out that for heads 48 and 50 are the mode and for tails 50 and 52 are the mode – linking today's data to mean, median and mode. A number of students extend this lesson to figure out the mean and median of this set of numbers. We also discuss outliers and determine40 and 60 are both outliers for both heads and tails – my students had decided to take out any numbers that did not add up to 100 total tosses.